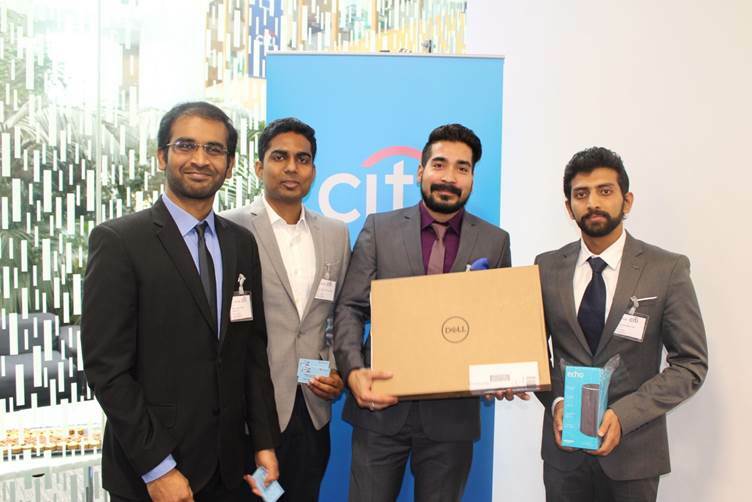 Citi’s upStart Accelerator programme, which features postgraduate students from five universities across the island of Ireland, has drawn to an end at a Dragon’s Den final in Citi Ireland. With eight teams making it to the final, Team Imbibe from Trinity College Dublin was the overall winner with Team EZ-Leap from the National College of Ireland as runners-up. Team Imbibe has developed a start-up providing digitized interactive psychotherapies delivered over web and mobile, aimed at people with autism, while Team EZ-Leap, is developing technology that allows public transport users to hop on and off without tagging-off. Both teams have won a trip to London to meet with Citi Ventures, Citi’s accelerator and key innovation driver. In addition, they will visit various accelerators in London, including Pivotal Labs, Microsoft Accelerator, Wayra Accelerator, and Level39. They also received equipment from Dell, Microsoft and Amazon to further their business development. upStart was established by Citi Ireland and Citi Belfast in 2011 as a programme to pair student start-up teams with Citi mentors as the students work on a start-up idea for their master’s degrees. Originally running in Trinity College Dublin and Queen’s University Belfast, in 2017/2018 upStart over 200 students applied to enter the upStart programme from five universities across Ireland and Northern Ireland; Trinity College Dublin; University of Limerick; National College of Ireland; Queen’s University Belfast and Ulster University. This year, 24 teams competed, working with over 70 Citi mentors for nine months. The business ideas utilised a range of emerging technologies including cloud innovation, AI, and IOT amongst others. Typically, master’s students choose to stay in academia or enter the private sector, upStart gives students a third option of building their own start-up and business, while ensuring that whatever path the students choose, they will have the confidence and skill set to pursue it. The Dragons judging the final included Donal McCarthy, Technology Head of Innovation at Citi, Andrew Macadam, Customer Success Lead at Microsoft, Rob Lamb, Cloud Business Director at Dell EMC UK&I, and Brendan Monaghan, Chief Executive Officer at Neueda. In announcing the winners, the dragons stressed the importance having a strong team dynamic, with modern businesses needing, “a hipster, a hacker, and a hustler” to succeed. Next ArticleHow can we revolutionize banking with the help of blockchain?